News: Harpa Concert Hall and Conference Centre in Reykjavik, Iceland, by Henning Larsen Architects and artist Olafur Eliasson has won this year's European Union Prize for Contemporary Architecture, the Mies van der Rohe Award. The crystalline Harpa Concert Hall and Conference Centre by Henning Larsen Architects and Studio Olafur Eliasson with local practice Batteríið Architects beat four other projects on the Mies van der Rohe Award 2013 shortlist to scoop the €60,000 prize. The Emerging Architect Special Mention award was given to María Langarita and Víctor Navarro for the Red Bull Music Academy, where they took over a warehouse and filled it with makeshift huts, providing individual studios for 60 musicians alongside a lecture hall, recording studio and staff offices. The award ceremony will take place on 6 June at the Mies van der Rohe Pavilion in Barcelona, Spain. Opened to the public on 4 May 2011, the Harpa Concert Hall is clad in panes of clear and colour-coated glass on a faceted steel framework, scattering glittering reflections of the surrounding harbour and sky. Read more and check out a full set of images of the Harpa Concert Hall in our earlier story. The biennial Mies van der Rohe Award is the most prestigious accolade in European architecture and is awarded to the best building completed in the last two years by a European architect. The four other projects on this year's shortlist were the Superkilen park by BIG in Denmark, Metropol Parasol by J. Mayer H. in Spain, a retirement home by Aires Mateus Arquitectos in Portugal and a Market Hall by Robbrecht en Daem architecten and Marie-José Van Hee architecten in Belgium. See all the projects shortlisted for the Mies van der Rohe award 2013. Previous winners include David Chipperfield for the Neues Museum in Berlin in 2011 and Snøhetta for the Norwegian Opera & Ballet in Oslo in 2009. See all our stories about the Mies van der Rohe Award. The prize is organised by the European Commission and the Mies van der Rohe Foundation, which was established in 1983 with the initial purpose of reconstructing the iconic pavilion designed by Modernist architect Ludwig Mies van der Rohe for the 1929 Barcelona International Exhibition, and now organises exhibitions and events promoting the study of Modern architecture and Mies van der Rohe's work. This year's winning firm was founded in Denmark in 1959 by its namesake Henning Larsen, who last year was among the five laureates of the Praemium Imperiale arts prize awarded by the Japan Art Association. Henning Larsen Architects' recent projects include plans for a Danish headquarters for software giant Microsoft and a proposed complex of public and leisure buildings in Trondheim, Norway. Danish-Icelandic artist Olafur Eliasson has worked on several other architectural projects throughout his career, including a fort-like headquarters for a Danish investment company and a temporary pavilion outside London's Serpentine Gallery, which he designed with architect Kjetil Thorsen of Snøhetta in 2007. Harpa, the Reykjavik Concert Hall and Conference Centre in Iceland, is the winner of the 2013 European Union Prize for Contemporary Architecture - Mies van der Rohe Award, the European Commission and the Mies van der Rohe Foundation announced today. 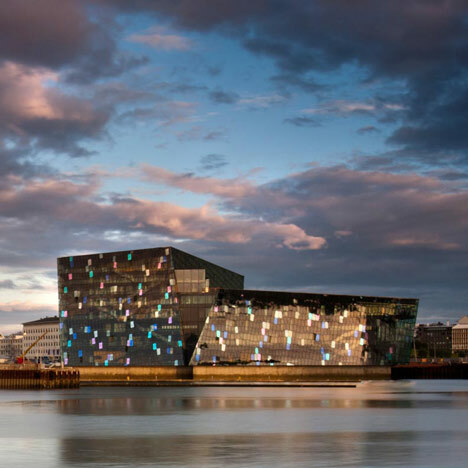 Designed by Henning Larsen Architects, Batteríið Architects and Studio Olafur Eliasson, the building has helped to transform and revitalise Reykjavik harbour and brought the city and harbour district closer together. The 'Emerging Architect Special Mention' award goes to María Langarita and Víctor Navarro for the Nave de Música Matadero (Red Bull Music Academy) in Madrid, Spain. The award ceremony will take place on 7 June at the Mies van der Rohe Pavilion in Barcelona, coinciding with the celebration of the 25th anniversary of the prize. "Architecture is one of the most visible expressions of our contemporary culture. My warmest congratulations go to this year's winners – indeed, to all of those who made the final shortlist. They have created buildings which are not only of the highest aesthetic and technical quality, but also places which touch our emotions and bring people together. I would also like to thank the Mies van der Rohe Foundation for their excellent collaboration in helping to bring the best of contemporary European architecture to worldwide attention," said Androulla Vassiliou, European Commissioner for Education, Culture, Multilingualism and Youth. Harpa's crystalline structure was inspired by Icelandic landscapes and traditions. Its dramatic design captures and reflects the light of the city, ocean and sky to thrilling effect. Wiel Arets, Chair of the Jury, said: "Harpa has captured the myth of a nation – Iceland – that has consciously acted in favour of a hybrid-cultural building during the middle of the ongoing Great Recession. The iconic and transparent porous 'quasi brick' appears as an ever-changing play of coloured light, promoting a dialogue between the city of Reykjavik and the building's interior life. By giving an identity to a society long known for its sagas, through an interdisciplinary collaboration between Henning Larsen Architects and artist Olafur Eliasson, this project is an important message to the world and to the Icelandic people, fulfilling their long expected dream." Antoni Vives, President of the Mies van der Rohe Foundation, said: "It has been an honour for the city of Barcelona and the Mies van der Rohe Foundation to grant this Prize with the European Commission for the last 25 years: a quarter of a century of the best European architecture. I would like to congratulate the winners of this 13th edition and I would like encourage architects to continue to play their role as catalysts for transforming cities." The architecture sector is at the heart of Europe's vibrant cultural and creative industries. It directly employs more than half a million people, as well as more than 12 million in the construction sector. Architecture is part of the cultural and creative sectors, which contribute 4.5% to the EU's GDP. The European Union Prize for Contemporary Architecture – Mies van der Rohe Award highlights the contribution of European architects to the development of new ideas and technologies in contemporary urban development. Launched in 1987 and co-funded by the EU Culture Programme and the Fundació Mies van der Rohe, the prize is the most prestigious in European architecture. It is awarded every other year to works completed within the previous two years. The winner receives €60 000. This year’s ceremony is the 13th to take place since its launch.